Town & Country Jacket With British fashion conquering the catwalks of the world and Hollywood loving all things British there has never been a better time to embrace the suave, sophisticated attitude of the British gentleman or gentlewoman. 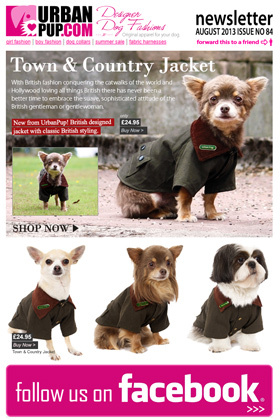 Whether strolling through the city centre or along a country lane your pup will look the part in our Town & Country Jacket. The beautiful soft corduroy collar has an enamel Urban Pup label pin as standard that adds just that little extra touch of class. The outer colour is complimented with a dark green tartan lining and you can depend on this coat keeping out the wind and the rain in days ahead.